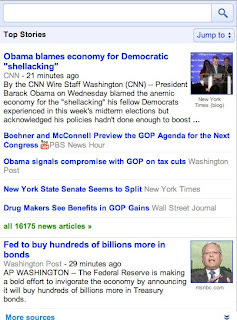 Last November, we redesigned Google News for mobile access on smartphones including Android, iPhone and Palm Pre. Today, we’re globally rolling out new usability and visual enhancements that we hope will make browsing news on your smartphone easier. In addition, the default view of stories is now collapsed, to reduce scrolling time. You can ‘expand’ a story by tapping ‘More sources’, which brings you to related stories from other sources. 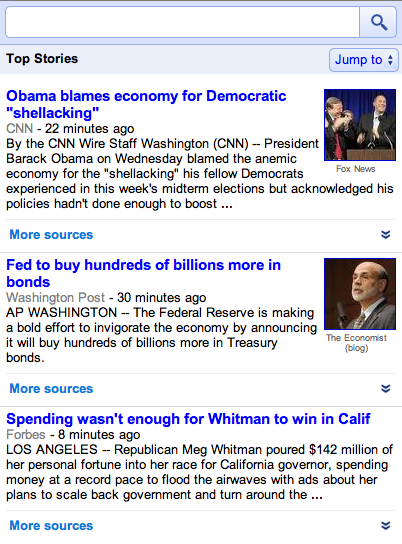 The screenshots below show the collapsed and expanded view of a story. We need a Google News App for Android. 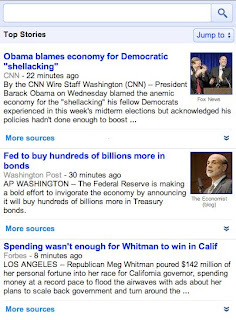 Thanks Google to improve the news sites for smartphones. One other thing to tell u that you are always providing great information. I like it. Keep going on. Thank you for supporting Palm webOS with this update!